As promised, here is another battlereport. 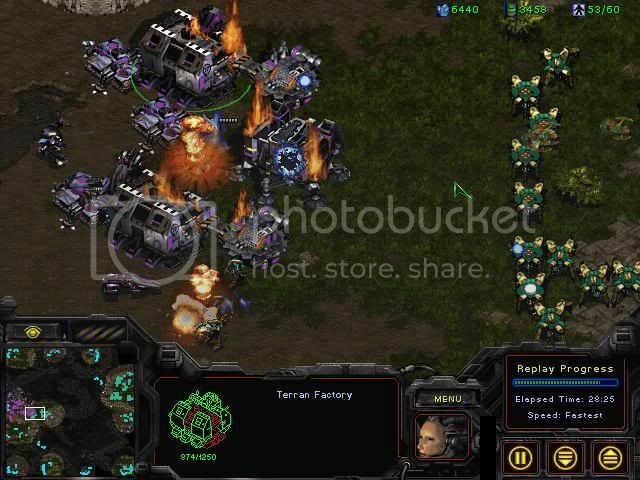 This was another TvP on Python v1.3 this time. I decided to try the mech build which is the standard method and leave MnM for another match. The game starts with the usual block on the entrance incase of any early aggression and its generally a good idea to do. 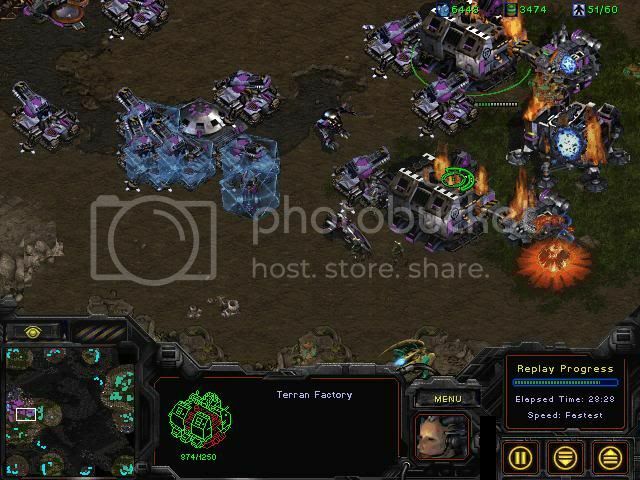 Since mech is the method of choice, a factory is laid down as soon as enough gas is accumulated and siege tech research is started shortly afterwards. 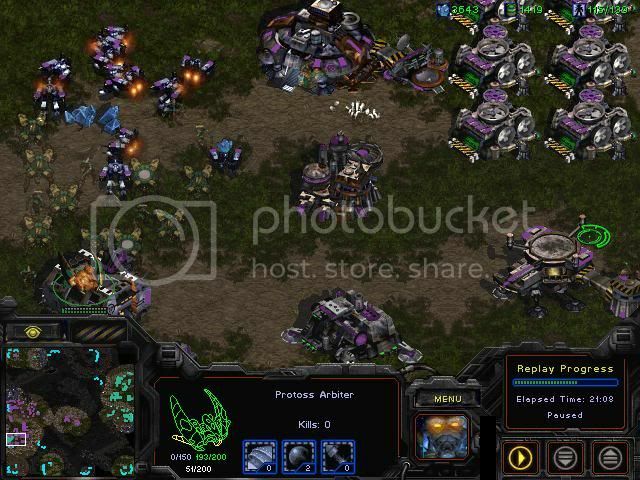 In the meantime, the Protoss player has blocked his entrance with a probe and zealot and teched straight to reavers planning to go for a drop. 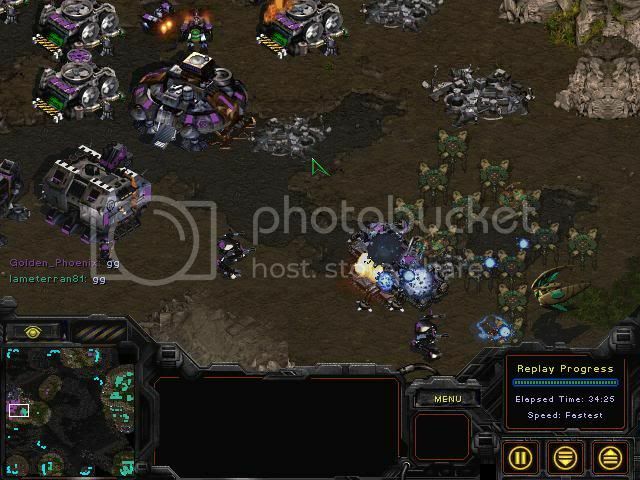 A brave SCV not shown in these screenies to protect his identity and spare his family from further pain managed to infiltrate the base by killing the probe and passing the zealot to see the robotic facility losing his life in the process. 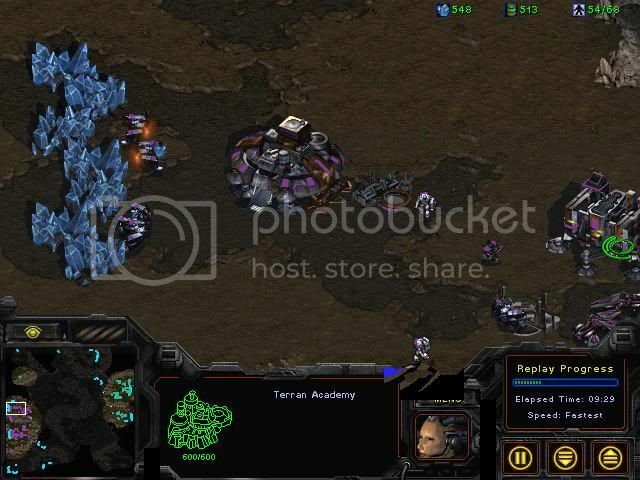 Further scouting is denied and the shuttle is getting closer to the Terran's base. 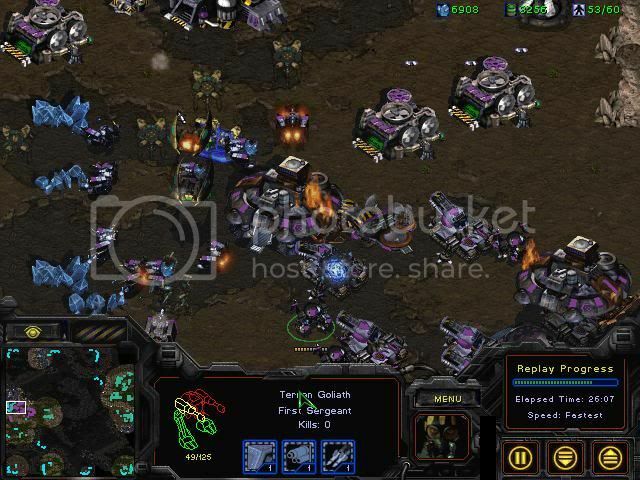 The reaver is dropped and manages to kill 4 SCVs with the first hit escaping when reinforcements arrive. 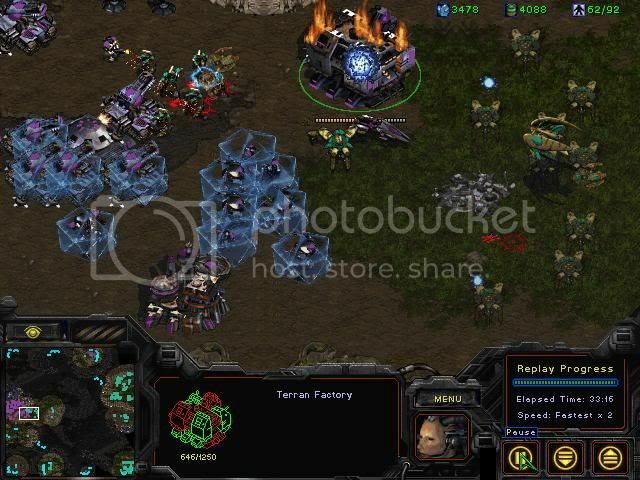 An expansion is taken by the Terran player as the Protoss player is taking his effectively gaining a slight eco advantage. 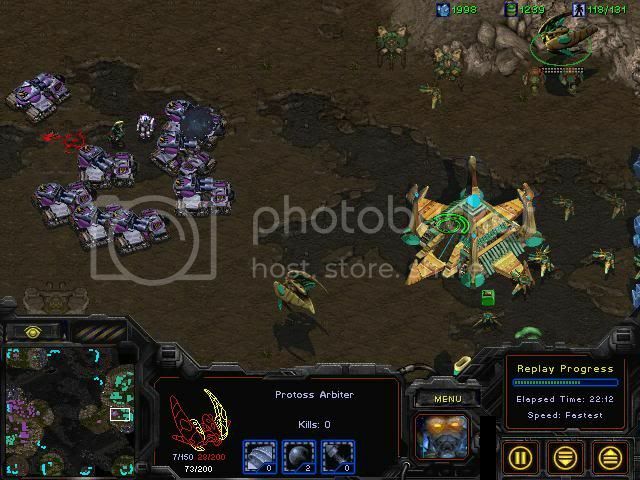 Of course the Protoss player isn't done yet with the reaver. 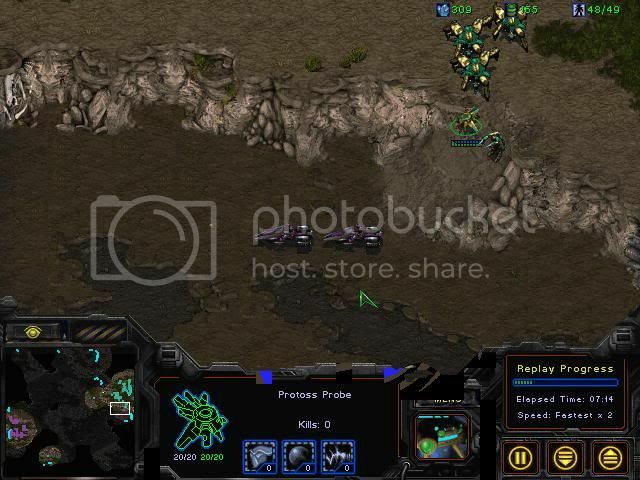 He drops right into the Terran's exp sniping a tank, possibly another worker or two before escaping yet again. 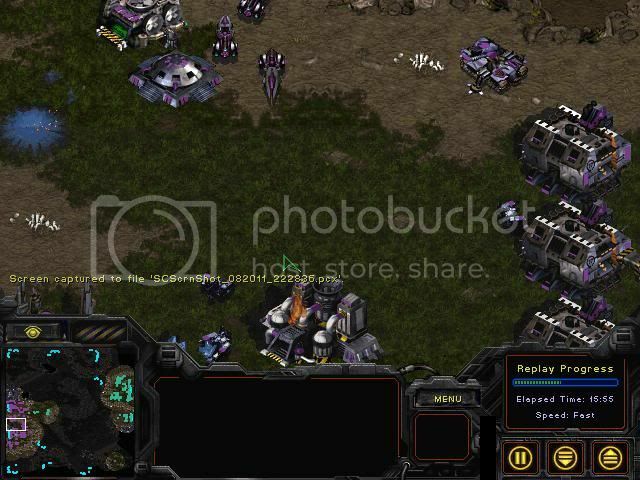 A brave medic decides to follow the shuttle even against the commander's order. It is feared that she has lost her life after this screenshot was taken. 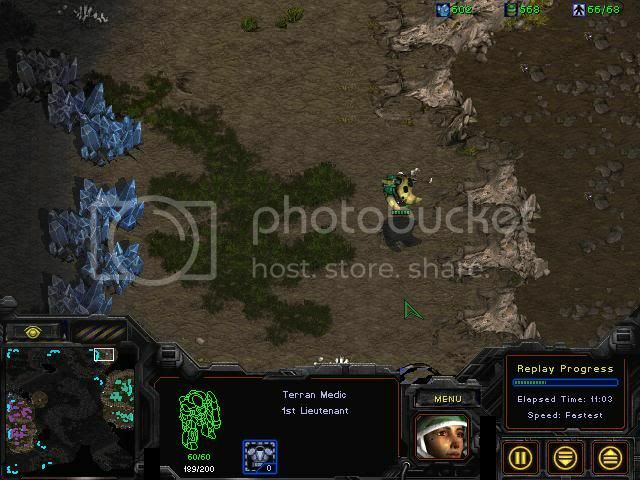 After a scan reveals a mostly dragoons army, the time is just right for our Terran player to engage. 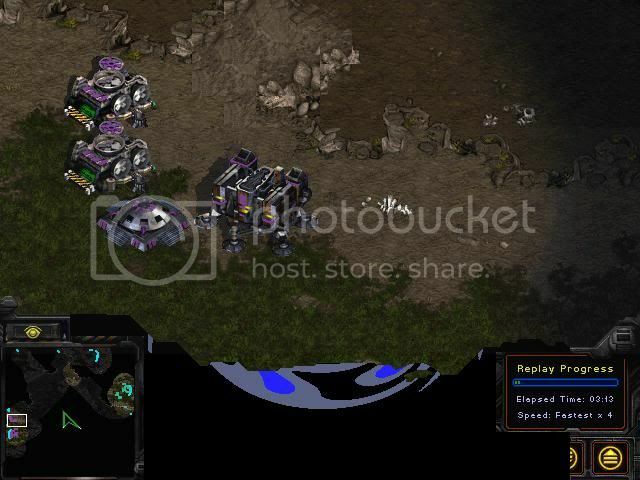 He moves his mech army with some MnM he had from earlier infront of the Protoss base but the reaver strikes once again! 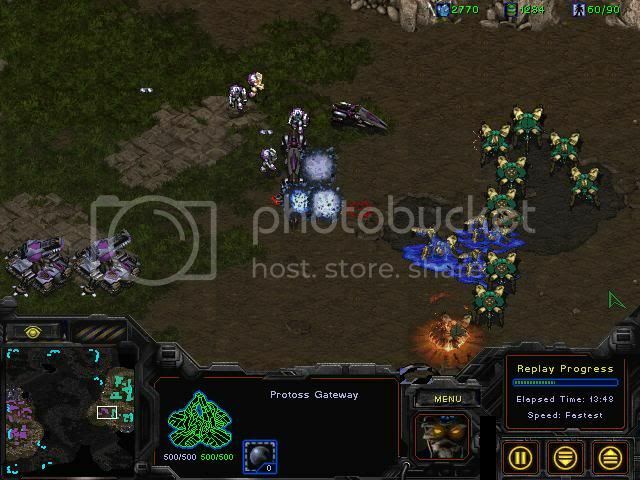 As the Protoss camps outside the Terran's base, a little counter attack is in effect. 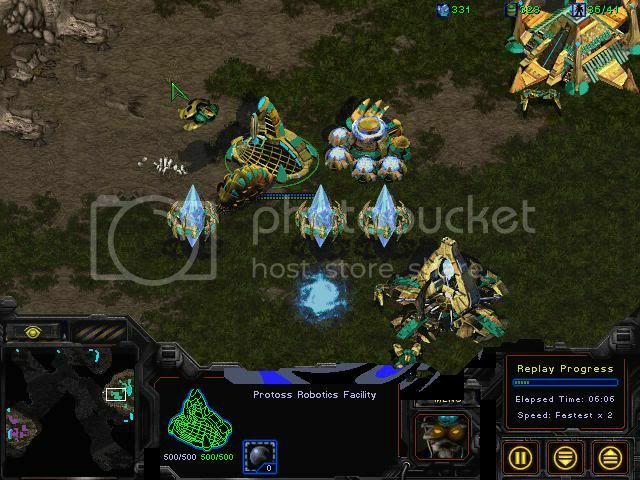 7 vultures sneak around the Protoss army and head right towards the Protoss' exp. 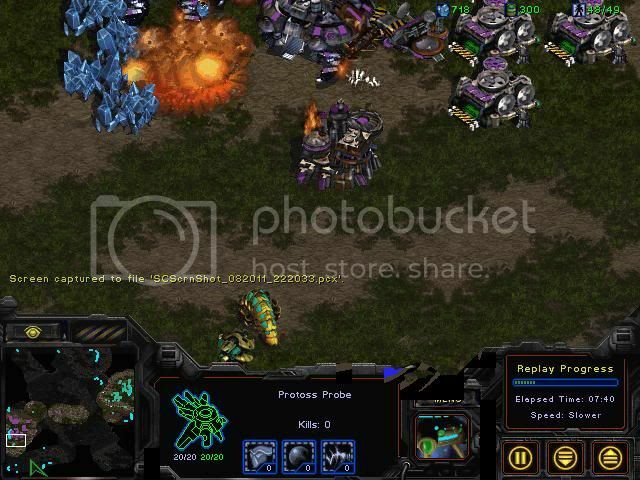 7 probes were taken out making this attack somewhat successful. 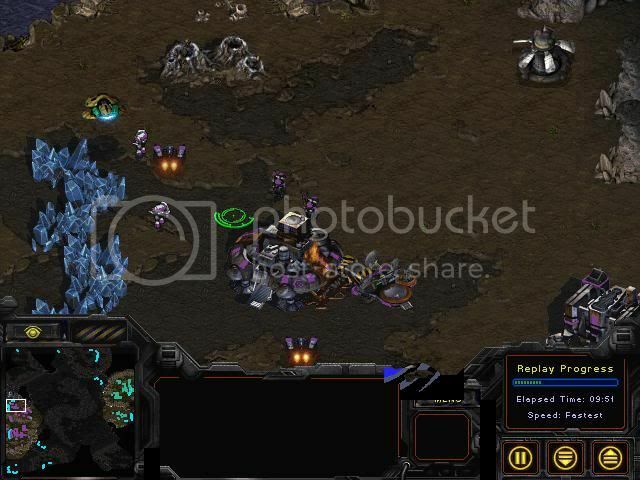 Unbeknown to our Terran player, the Protoss player has started producing arbiters and ending up recalling some units right into the Terran's base tearing it apart. The main is lost aside from two factories. 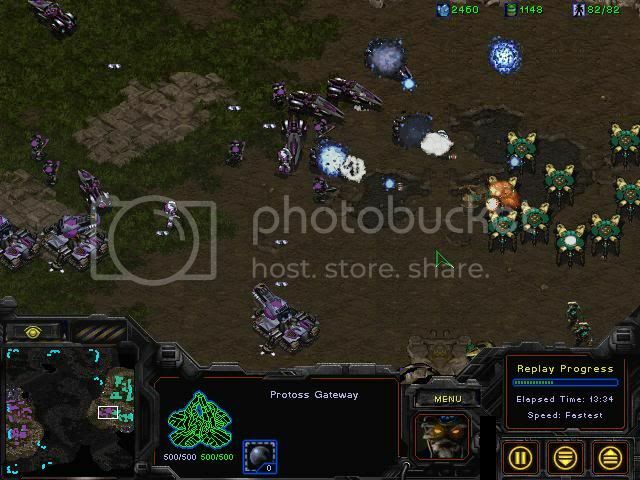 The Terran counterattacks the Protoss player knowing that this is the best time to strike. 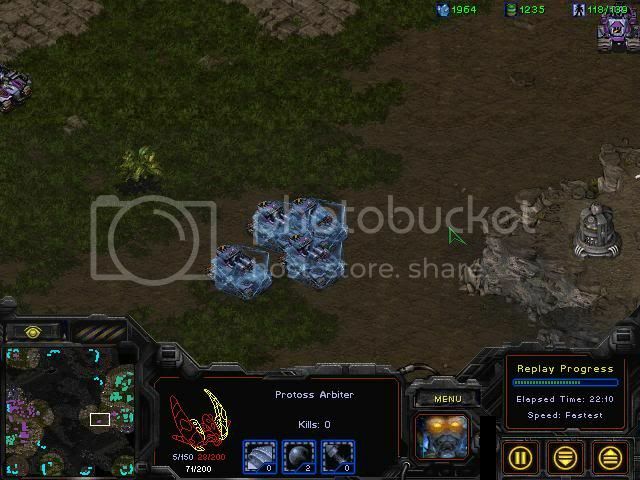 With the help of arbiter's and with the lack of enough vultures, the Protoss is just able to hold off the push forcing the Terran player to retreat. 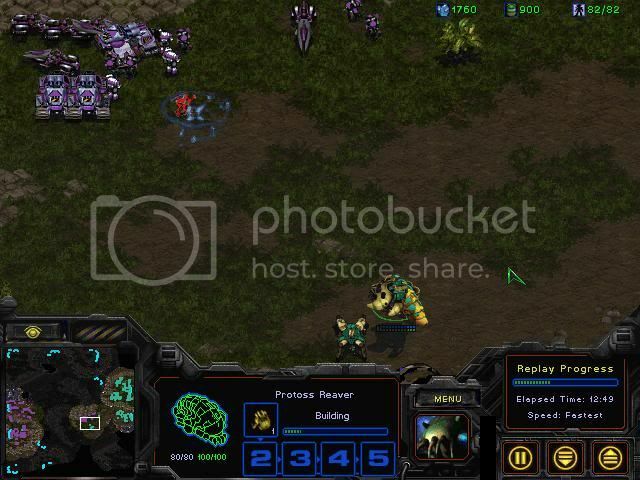 As the battle rages, the Terran's third is denied and the Protoss attempts another recall right into the Terran's exp trying to crush his eco for good. 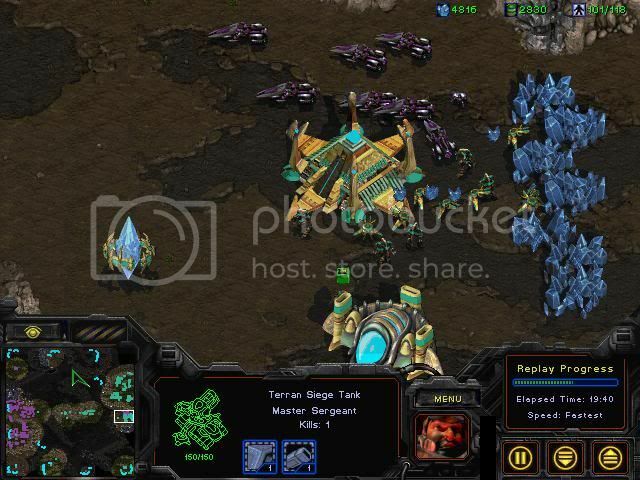 With his exp mined out(even though there were tons of money saved) and with the lack of structures and ability to exp, the Terran is forced to make a final stand again the might of the Protoss army. Also yeah the BR is a bit long but thats to be expected of a 35 minute game. The ones I've done were only like 20 pictures but much shorter games. I liked this anyway though. I suggest working on macro. 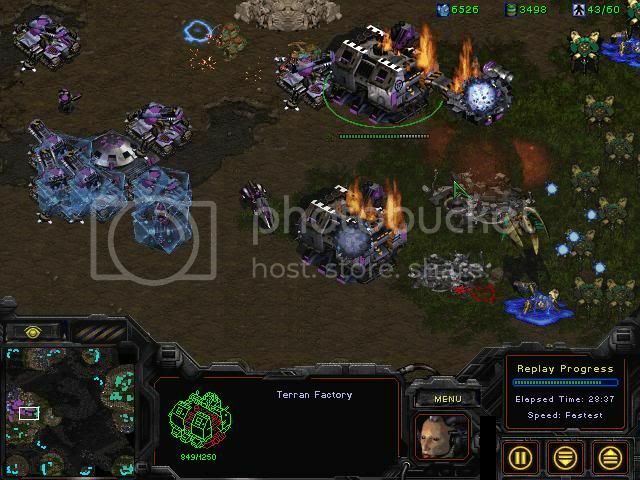 It's quite a bit harder than in SC2, but you'll get a lot better by getting it down. Just work on one build vs comp sometime and make it tight. Looks like it was a fun game. Makes me want to play just one more game of BW. From the screenshot, it looks like you had 1 far ahead of the others (at least 2), and the 2 behind were just clumped up. 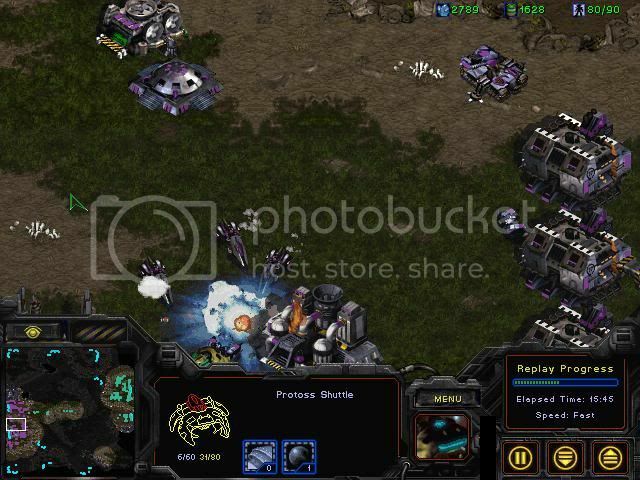 ^^It was pretty fun As for the tanks, well since I can't shift queue commands and can only do that to make them move, I didn't want to be caught offguard being close to the protoss base and all so I just left them grouped and sieged up as I engaged. Could've spread out but I knew he saw it coming and didn't want to give him a chance to get ready with reinforcements I agree though, I should've moved them up a bit and spread them out more. 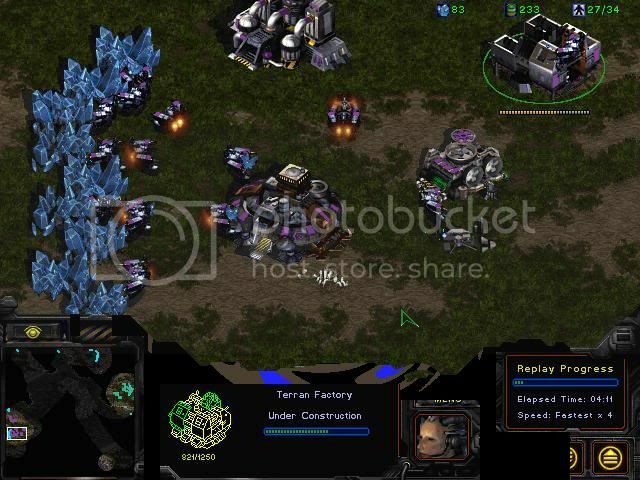 Most of the marines were from the early game when I was still building the factory and the 2 medics or so, I just added them in since I had my rax doing nothing when my factory was working and I was accumulating a lot of resources. My macro wasn't as good as my first BW game(previous battlereport) but it'll only improve once I start getting used to my control groups . 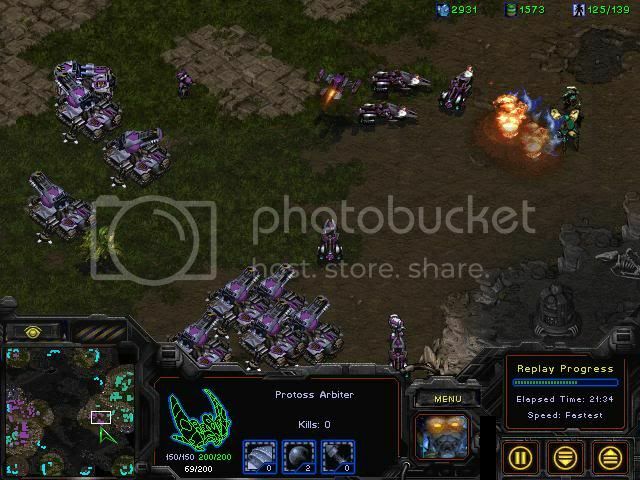 Nice writeup, it is very rare that you will use a bunker in you're wall off, maybe in an extreme case if you scout or know like a 4pool or a proxy 2gate zealot rush is coming ( Because zerglings could possibly fit through the wall if its not ling tight, and just a precaution against protoss if you're wall is also not tight at all ) , in most cases you never want the bunker as apart of you're wall ( don't preemptively make a bunker at you're wall just to try to be safe , because it will just put you behind ) , once you get all of your scouting down , you should be able to learn the time when you would really need that bunker, it's in extreme cases! ^^Bottom and left? tbh, I dunno what you mean. That area was pretty tight, only opening was where the bunker was, so, I didn't have to put one down but I did as a precaution. I made some units from the factories, kinda explains why we have similar army size when we engaged the first time but my macro slipped afterwards and I never recovered. Since I'm working with invisible control groups, I keep forgetting what's where or I might concentrate on something and forget to make units until it's a bit later, still work in progress. The exact game you're talking about isn't ringing a bell but I feel like I have an idea what happened. 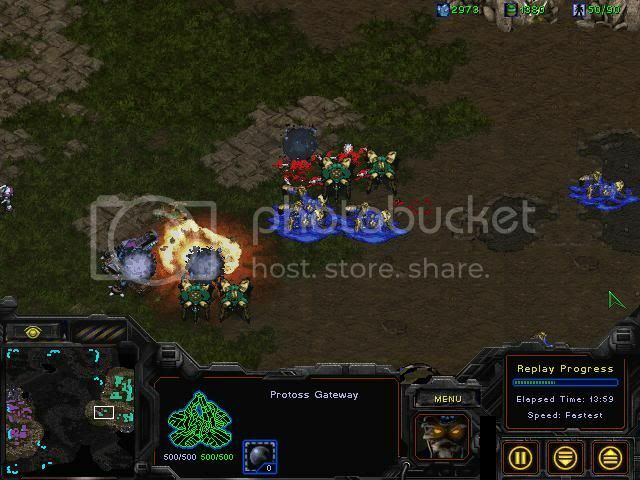 Flash likely went for an expansion before gas which is something not super common. 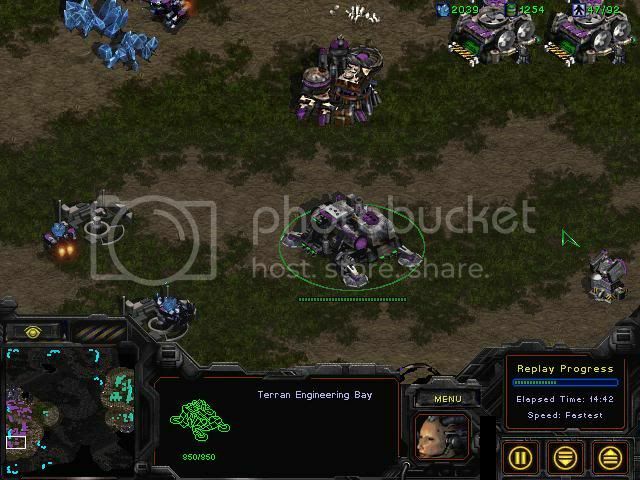 Naturally this delays his tanks so he needs a bunker to defend. 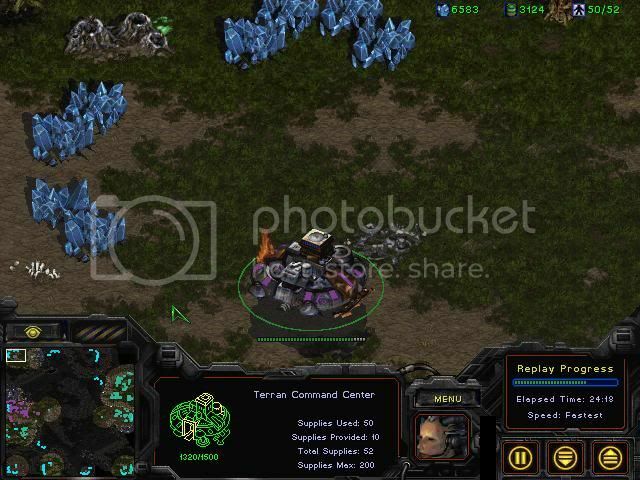 If you double check the VOD, I would bet this bunker was actually at his natural expansion, not in his main. 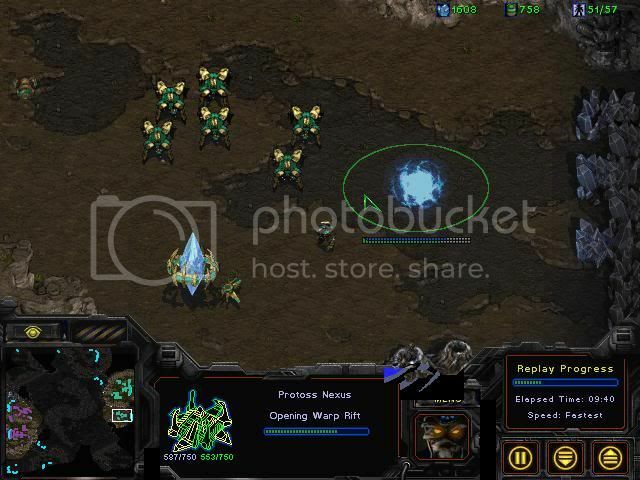 Sometimes people fly their barracks over to the front to form a bit of a wall so Protoss can't just run by the bunker. Just a question, why did you place the rax, and 2 facts outside of your nat?